1. Utah: I’m pretty sure this is every BYU fan’s favorite game. This is the last game against the Utes for at least two years, and the last three years have been a nightmare for BYU. As bad as the Cougar fans think we have it, imagine how the players feel, especially Cody Hoffman and Kyle Van Noy! They are both 0-3 against Utah and it would be disappointing if they left BYU with four big, fat “L’s” against Utah. I think kicking and special teams will have another huge role in this game. Two of the last three games have been decided by a last second field goal attempt. Both of those have ended with Ute fans storming the field. Kicking will be huge. Hey, but fourth time’s the charm, right? 2. Notre Dame: This is BYU’s second to last game and depending on what their record is, this game could dictate whether or not the Cougs bust the BCS. The Fighting Irish lost, in my opinion, their three best players: LB Manti Te’o, TE Tyler Eifert, and RB Theo Riddick. Without Eifert and Riddick, BYU would have won, especially if Riley had hit Hoffman on that should-have-been-a-touchdown pass in the fourth quarter. I’m still a little bitter about that. Remember Eifert’s first half against BYU last year? They didn’t have an answer for him. With QB Everett Golson also not in the lineup for the Irish due to suspension, I think BYU wins in South Bend this year. 3. Texas: Who isn’t excited about Texas being BYU’s first home game? Such a great environment, so much energy. I can already see it. I can already taste it! Texas always has a good team and this year shouldn’t be any different. The Longhorns have highly touted running back Malcolm Brown who was sensational in high school; however, he hasn’t proven himself in college yet. Expect him to have a good year in Austin. I don’t think there is any way BYU loses this game. Maybe I am just being overly optimistic like I usually am, but I think BYU comes away with a convincing win. 4. Utah State: Being a BYU fan in Logan is hard, especially when this game rolls around. If the Cougars lose, I’m hearing about it from EVERYONE for the next year! Every year this game is exciting. 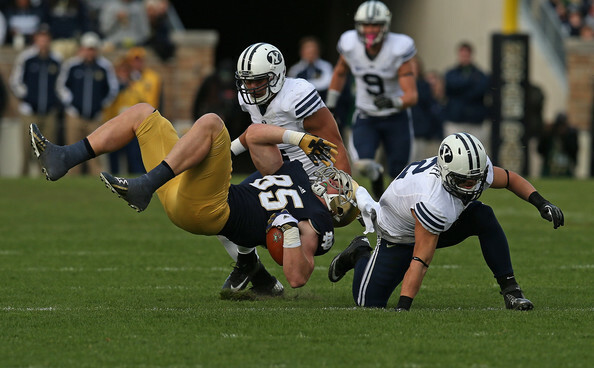 Sadly, last year’s game is more remembered for the Taysom Hill last-minute injury instead of the 6-3 Cougar victory. Utah State is coming off an 11-2 and a #16 final ranking and with Chuckie Keeton back, they could be dangerous. Utah State will put up a major fight, especially with the game in Logan. Expect it to be a nail-biter! 5. Wisconsin: Camp Randall Stadium is going to be juiced when BYU travels there on November 9th. I’ve heard it’s one of the best college football atmospheres in the country. BYU will be facing former Utah State coach Gary Andersen and let’s not forget how motivated he got his Utah State teams to play BYU. While perhaps not a rivalry game for most in Madison, you can bet that Andersen will be preparing for the showdown with a little extra attitude. With BYU being a big upset alert for the Badgers, they will come out firing. This game will be remembered for a long time. Honorable Mention. Nevada: I chose this game because it is Kyle Van Noy’s last regular season game as a Cougar, ending his college career where it all started. This will be a very special game and I expect KVN to have one of his best. BYU basketball did a similar thing with Jimmer. They played in Jimmer’s home town of Glens Falls, NYagainst Vermont. That was fun and all but there is a big difference compared with this game. Nevada is going to be a lot better because the Wolf Pack are actually good! This will not only be fun for Kyle and his family, Nevada has a chance at an upset. Expect not only a memorable last game for KVN, but also a good football game between two good teams. This season looks to be one of the best in BYU history! Go Cougs!